Motorola has released a range of metallic Moto 360s in Light Grey, Dark Grey and Light Gold variants. Just a few weeks back we reported on a new range of premium bands for the Moto 360, made by the Dodo brand. 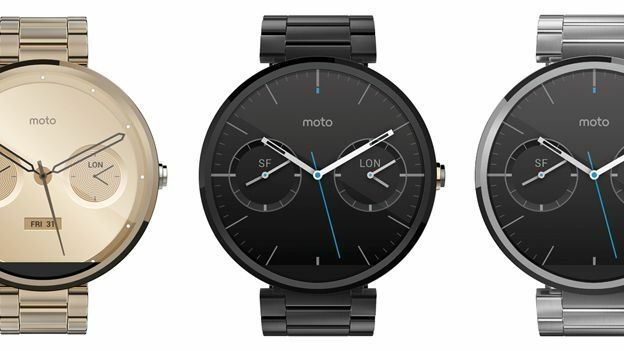 Now adding more options for budding smartwatch-ers, Motorola has launched three metallic versions of the Moto 360. While the Moto 360 was hands-down one of the most stylish smartwatches of 2014, these new metallic variants certainly add a bit of class as oppose to the original leather strap. If you're looking for a smartwatch that's suited to everything, from everyday use to formal occasions, then these Moto 360s might be ideal. Available in three versions; 23mm Light Grey and Dark Grey versions or a slightly thinner 18mm Light Gold edition. Not only do they look good, but the straps themselves are made from aircraft-grade aluminium. That means they are even more durable, without adding too much extra weight. The new metallic range will set you back £229 when they reach the UK. The Light Grey and Dark Grey versions will be released mid-February, while the Light Gold edition will touch down in March. Looking to invest in a smartwatch to show off around the office? Then be sure to check out T3's best smartwatch round-up looking at some of the top titans in wearable tech.